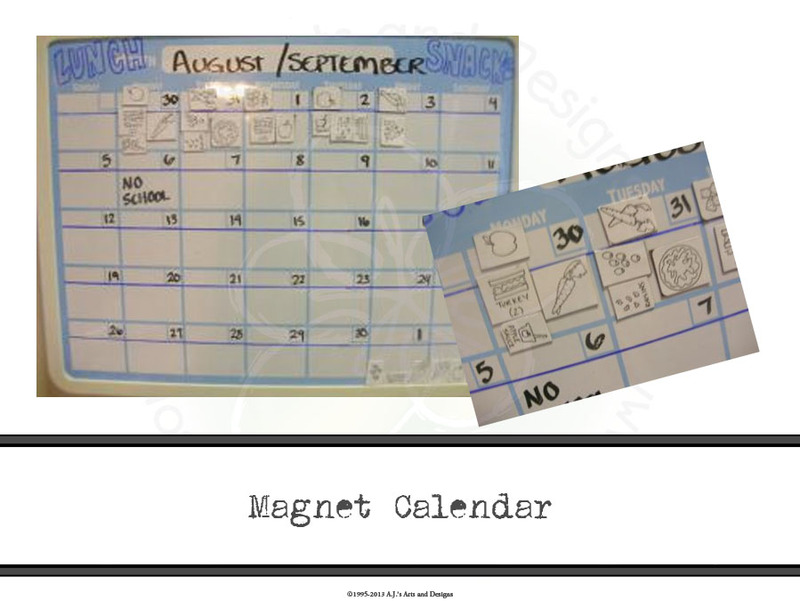 What’s for Lunch – Magnet Calendar? | Who Are You Calling Crafty? What’s for Lunch – Magnet Calendar? I needed to think of some way to keep track of my daughter’s lunch/snack menu for the week. The only real criteria I had was that it had to be easy enough that she could do it herself because it is her lunch and she has a right to pick a healthy lunch/snack. Also needed to be something that I would one, see and two, be easy to change, if she changed her mind, she is 4. I was thinking about doing a paper calendar even a felt one and then it hit me: how about a giant magnet calendar! 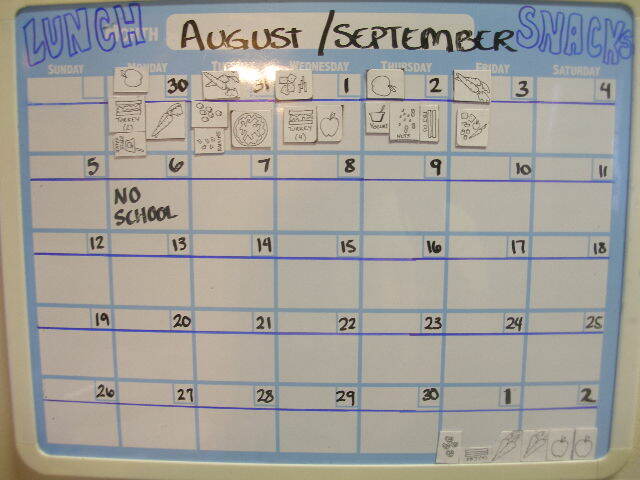 I had a dry erase magnetic calendar from my hotel days. I went through and added a line across the top of each squares for snacks and then the bottom would be used for lunches. I then figured out what lunches would be – sandwich (turkey 2 or 4 pieces, PBJ 2 or 4 pieces), English muffin pizzas, Hodge Podge (crackers, cheese, olives, raisins, apple carrot, etc. ), fruit, vegetable, yogurt, apple sauce, and snack items (pretzels, nuts, crackers, apples, carrots, etc.). 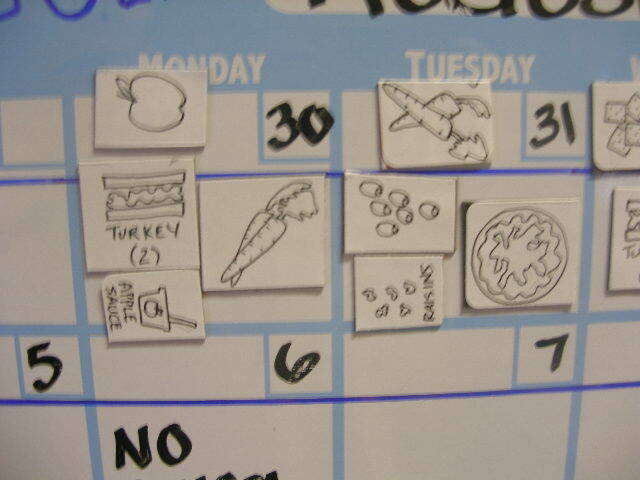 I then pulled out my blank mailing labels and drew a sandwich, olives, pizza, fruit, veggies, etc. (clip art would work just as well and you would have colored pictures) then applied them to an old magnet and cut them out. I placed the calendar right on the door of the fridge so it is at eye level and I now know what my daughter has had and is having during the week. If she wants to change it all we have to do is remove the magnet. Lunches and snacks in my house have always been healthy (apples, carrots, etc.) 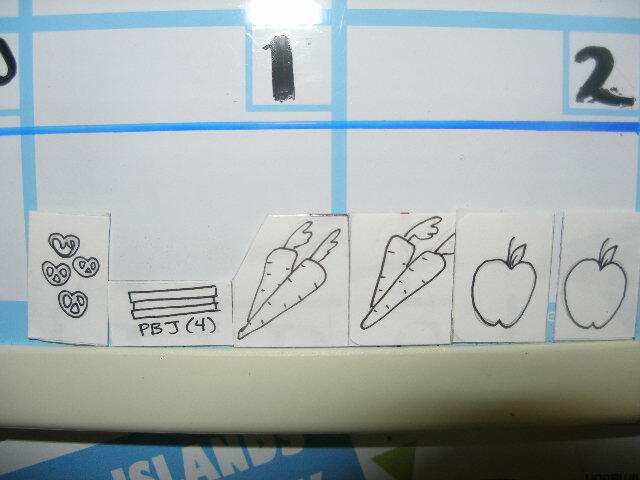 I wanted to make sure she has at least one fruit and one vegetable a day, so I did make 5 fruits and 5 vegetable magnets. I’m sure I will be making more as I think of them but I think we are off to a good start with our What’s for Lunch? Calendar. 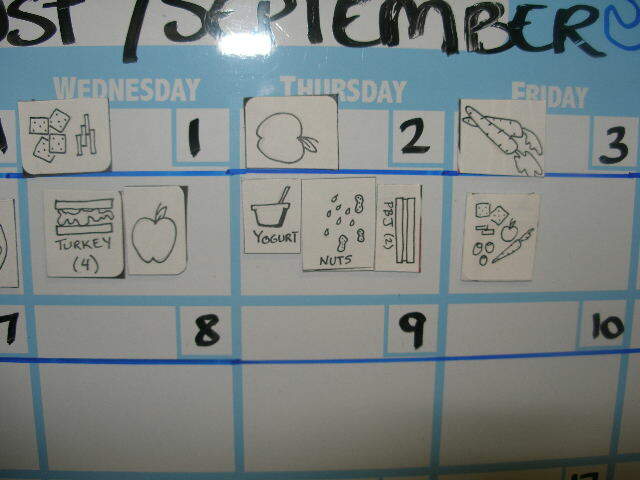 Full view of the calendar – with lunches and snacks planned for next week. Hi, I'm following you on GFC as Blogroll Please. Please take a look at my blog and follow me back.http://blogrollplease.blogspot.comThanks!